Your passport to a whole new world of Japan Pop Culture! 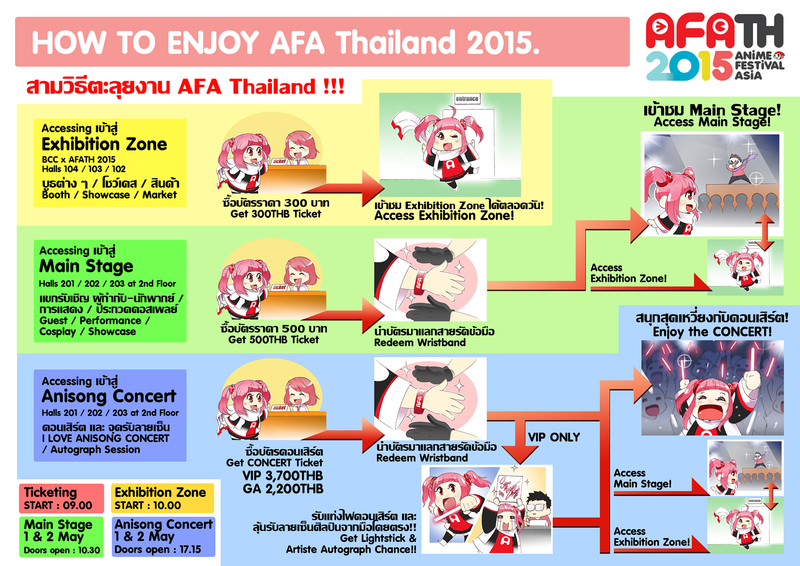 There are many activities happening at AFA Thailand 2015. The following is an outline of the many available tickets to access the content you desire. Together with Bangkok Comic Con, AFA Thailand will cover over 15,000 SQM of exhibition space. To access the main exhibition grounds, you will need the 300 THB / Day ticket, and by increasing another 200THB you’ll also be able to access the numerous stage contents we have available for you. Below is an quick overview of what you need to do, to get access to the Biggest Pop Culture Events happening at Bangkok! Important Note – Accessing Level 2 Stage Contents. For Stage ticket and Concert ticket holders – please redeem your wristbands from Level 2 – Outside Halls 201/202/203 on the day of the event. Please present your ticket at the wristband redemption counter, and with your wristband you will be able to access all contents you are entitled to that day. Redemption of wristbands will take place from 8:30am on May 1st and May 2nd. A big part of AFA is it’s music concerts! 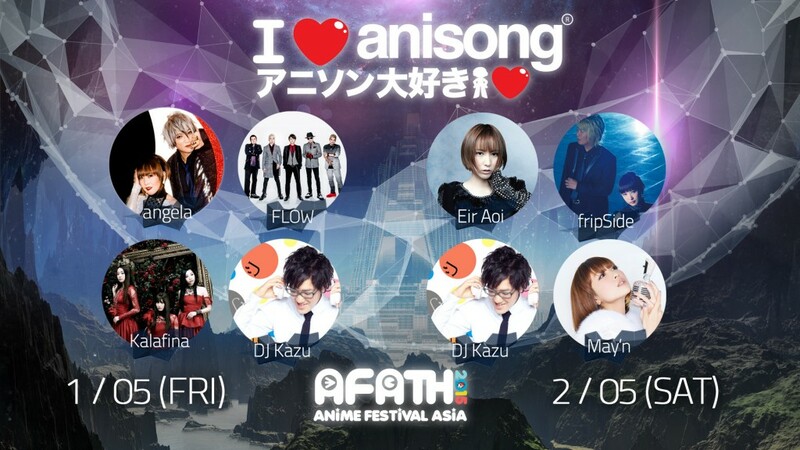 Here is all you need to know about AFATH’s I Love Anisong Concerts. All tickets are subject to Thai Ticker Major’s THB20 surcharge. Additional charges applicable depending on ticket collection method. All line-ups are given in alphabetical order and do not denote the performance order. All tickets are subject to Thai Ticker Major’s THB20 surcharge. Additional charges applicable depending on ticket collection method. Please note that only one ticket will be issued for the 2-day Super VIP package. The same ticket will be used as verification of concert entry over two days. Please ensure that you have read the FAQ here for Anisong ticketing. 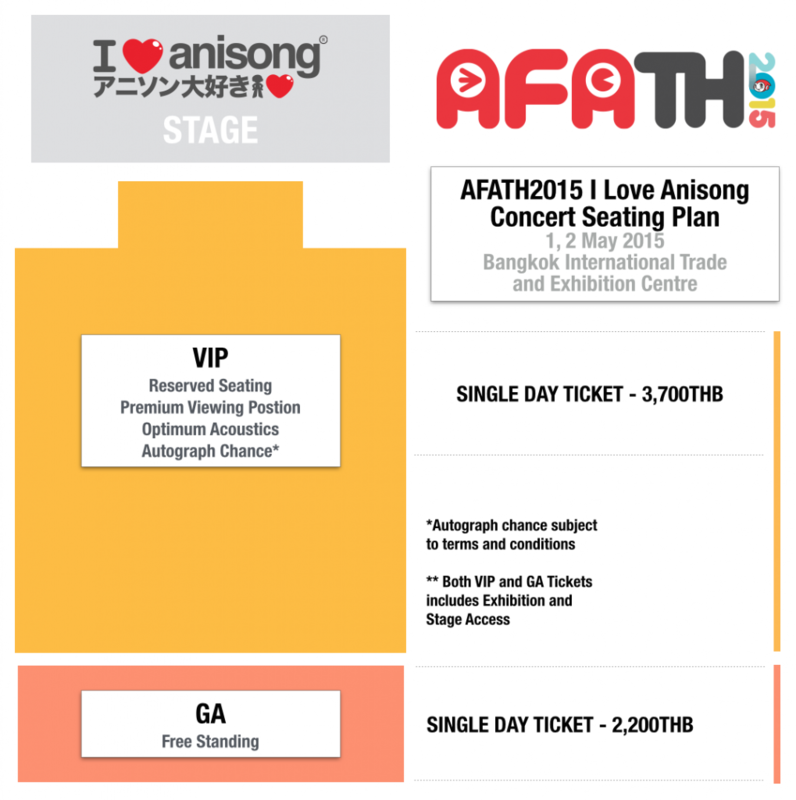 Collection of I Love Anisong tickets will take place from Apr 30 onwards on the second floor at 9am, on all days. Please remember to bring all documents specified by TTM for redemption. Tickets on sale now at Thai Ticket major! Click below to buy tickets now! Please note that the above seating map is for illustration purposes and is not to scale. Tickets on sale now at Thai Ticket major! Click below to buy tickets now! When will I Love Anisong concert tickets go on sale? 1-day VIP and GA packages will go on sale through all Thai Ticketing Major sales channels, website, call centre and outlets, on 27.03.15 Fri, at 10am. You can access the Thai Ticket Major website here for more information. Outlet details can be found here. Payment methods can be found on the TTM site here. Tickets may be bought, both online or at the venue. Please note that the mailing option is only valid for addresses in Thailand and does not extend to those outside of Thailand. There will be a 20THB charge for each ticket bought. Various ticket delivery and collection methods may incur an additional charge. How can I collect my “I Love Anisong” Concert ticket(s) if I purchased them online? For collection methods, please refer to the TTM page here and here. During collection, you are required to present the photo ID or passport and the actual credit/debit card used to purchase the ticket, during collection. If another person other than the original purchaser is collecting the ticket, the person must present the confirmation e-mail that is sent to your e-mail, a photocopy of the photo ID or passport and a copy of both sides of the credit/debit card used to purchase the ticket. All three items must be signed by the original purchaser and the person making the collection. If you have used another person’s credit/debut card to purchase the ticket(s), you will to present that person’s photo ID or passport, a copy of both sides of the credit/debit card used to purchase the ticket and letter of attorney verifying that you have been allowed to use the credit/debit card for the purchase. Collection can and will be refused if any one of the items listed above is not presented. Do I have to register an account on Thai Ticket Major’s site to purchase the tickets? You are required to register an account on the TTM site in order to purchase tickets. Please note that you need not enter a Thai phone number in order to register. You can use your own phone number if you are not from Thailand. Please enter your country code in the first box and the last seven digits of your phone number in the last seven boxes. All other numbers should go into the second box. Each transaction is only valid for 10 minutes and the transaction must be completed during this period of time. After which, the system will release the seats that you have back into the system. Please complete your entire transaction during that period of time. We are using Reserved Seating (allocated seat row/number) for the VIP tier and Free Standing, first-come-first-served for the GA tier. All VIP seats are system generated Best Available, the system will only automatically assign the best available seats at the point in time the tickets are added into the order. You will not be able to select your own seats. Please do not open multiple browsers to secure the seats. Please note that once seats have been added into your cart, they cannot be individually removed and require the emptying of the entire cart. Please contact Thai Ticket Major for assistance in the event of a lost ticket. AFATH 2015 will not replace any lost wristbands nor wristbands that have been determined to be damaged or clipped together intentionally. You will be required to present the TTM ticket, along with the corresponding wristband for your tier and the day of the event, at the entrance of the concert venue. Failure to present anyone of the items will result in refusal of entry. Please note that 2-Day VIP packages will only be issued on one ticket for both days. You will need to present the same ticket on both days before entering the concert. Lost tickets will not be replaced any circumstances. The Anisong ticket collection counter at the venue on the second floor of BITEC will be open on 30.04.15 onwards from 9am to 8pm everyday. What sort of ticketing plan is being used for “I Love Anisong” concerts? The “I Love Anisong” concerts are based on reserved seating for VIP tier and free standing for the GA tiers. Where can I collect my Exhibition+Stage wristband and light stick? The wristband collection counter at the venue will be located on the second floor of BITEC, next to the Anisong ticketing counters. Please note that you can only redeem your wristbands on the actual day of the event, eg, you can only redeem your wristband for 01.05.15 on 01.05.15. You cannot redeem it on 30.04.15. Do I need to show anything to redeem the Exhibition+Stage wristband and lightstick? In order to redeem the Exhibition+Stage wristband and lightstick(s), you will be required to present your TTM ticket (s). Your TTM ticket be stamped to denote that the items have been redeemed. Please note that 2-Day VIP packages will only be issued on one ticket for both days. During the time of redemption, you will be given a wristband that is colour-coded for a specific day and tier. This wristband is required to be worn securely at all times for entry in to the exhibition area, stage area and concert area. The same wristband is used for entry into these three areas. Please note that all wristbands are to worn before entry into the exhibition area, stage area or concert area. Entry will be refused if wristbands are not worn before entry. Entry will also be refused if wristbands are worn loosely and can be slipped off easily. Replacements will NOT be given in these cases. Is there any deadline in purchasing “I Love Anisong” concert ticket(s)? Will there be any on-site ticket sales for “I Love Anisong” ticket(s) on the day itself? Tickets will be sold at the venue. However, seats are subject to availability. If any tickets are sold out before the day of the event, those tickets will not be sold at the venue. You can pay by cash or by VISA or Mastercard cards. Concerts on both days will begin at 6pm, with doors opening at 5pm. As a general rule, you may only stand at where your seat is. However, leaving your seat to stand at another location, e.g. an empty seat, the aisle, etc, is not allowed at anytime during the concert. Persons who are found leaving their seats and standing at another location will be asked to return to their seats. Repeat offenders will be removed from the concert. I have booked “I Love Anisong” concert ticket(s) outside of Singapore, can I collect my tickets during the event day at the event venue? Can “I Love Anisong” Concert tickets help me gain entry to the exhibition and/or stage? Access to the exhibition and stage area come in the form of a wristband and is to be worn at all times. This wristband is given during redemption as outlined above. Please note that these wristbands will be colour-coded for a specific day. Tickets are not transferable and may not be resold, nor redistributed or used for any commercial or marketing event, activity, promotion or purpose, without the prior written consent of SOZO and TTM. All rights reserved to cancel any Tickets that have been transferred or resold or redistributed or otherwise used without the prior written consent of SOZO, and to deny any such Ticket Holder entry. Note that all prices mentioned in the FAQ and the AFA 2015 website are in Thai Baht. All overseas visitors may purchase their tickets through the Thai Ticket Major website. For any queries pertaining to the purchase of I Love Anisong tickets through TTM, please call the TTM Hotline at 0 2262 3456 or email [email protected] or the TTM Facebook page (https://www.facebook.com/ThaiTicketMajor) for assistance. Should you still encounter issues, please contact us at [email protected].